Thanks to Harper Children’s for sharing some new Middle Grade reads with our crew. 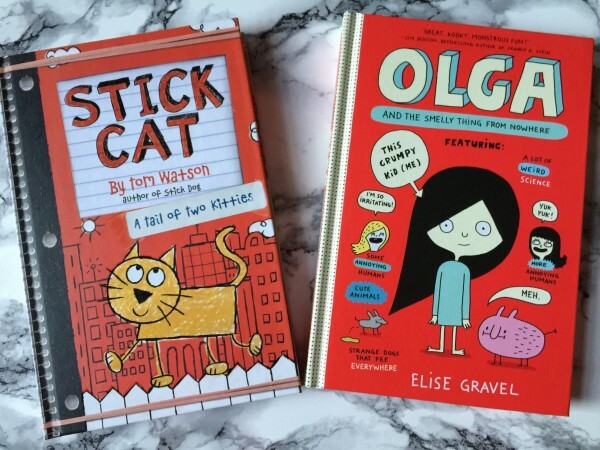 Olga and the Smelly Thing from Nowhere and Stick Cat are two titles that are sure to appeal to all middle grade kids – even reluctant readers – as the illustrations and stories are fun, silly and engaging. We’re giving away a prize pack with both books and a $50 Visa gift card to one lucky reader. My 9 year old son has loved Stick Cat as it’s so easier for him to get involved thanks to the illustrations and story so he was excited to check out this new book too. $50 Visa gift card to keep growing your family library! Entry details below. Eligibility is for US Residents only. Note: Thanks to Harper Children’s for providing prizing for this giveaway and for my children. As always all thoughts and opinions are our own. super cute prize pack, my little sister would love the books! I would so love to win these books the kids would love these. I think my Granddaughter would love these books. My grandkids would love these books. I love giving books to kids as gifts. Thanks. My daughter would love these books. We have grand kids who would love this! These look like great reads for my grandsons! Love getting new books for the kids. Great set, sounds like a great read! I follow on youtube under kelly tupick. I follow you on facebook under kelly tupick. These are amazing books that my kids would love to read! These books look so cute. I know my nieces would love them. My kids would like these books. Such cute books! Thank you for the chance to win! This sounds like a great book! My family would love to read it! I would love to give this to my niece Jill. I’d like to win for my cousin. These books would be fantastic to have for my family. My daughter would like these books. My niece would really enjoy this book! I would love that gift card. What a wonderful giveaway. Thanks for offering it. My niece would love reading Stick Cat. My son would love these books! He loves anything involving animals and bonus points if it is funny. I would so love to win these books! Looks like a sweet series of books! My niece would probably enjoy these. Thank you for the chance. My daughters would love this. Those books would be great for my niece & nephew. Thanks for a fun giveaway! Looks like a really good book to read! hiiii thanks for the giveaway. These sound like wonderful books my kids would enjoy. The kids would love these books. These look like really cute books! My granddaughter would enjoy these books. I would love to win these books!! Looks like a great read for kids. Would love to win, I think my niece would enjoy this book! The cat book looks really fun. Super cute books. I think my niece would adore these. I am an instagram follower of yours @cindywindy_blogs. I would love to win! Olga and Stick Cat would be hits here We love to read! Mother’s Day Weekend! I hope you have a nice Saturday! This would be perfect for summer learning. I’ve spent most of the day outside…it’s so gorgeous out! 5 13 comment – planted the patio flowers today! What a great giveaway, granddaughter would love the books! Happy Mother’s Day! great giveaway! Happy Mother’s Day! I hope you have a nice day!! I have a niece and a nephew that would love these books. This will be great for my grandchildren. I sure would love to win this one thanks for the chance, Happy Mother’s Day. 5 14 comment – Happy Mother’s Day! I think my boys would enjoy the books. The gift card sure would be awesome to win too. I hope you are having a good Monday! I hope you’ve had a great Monday! We would love these books and hope you had a nice Mother’s Day. I like that these books have quirky humor! I bet a lot of kids would enjoy this book! I love these fun kids books! Great books, would love them for the grandkids. We would love to win this one we love new books. 5/16 Thanks for the great giveaway! Whoa….having a rough day…..tomorrow must be better! I hope you are having a really nice Wednesday! Sure would love to win this one love gift cards and books. 5 17 comment – we are having too much rain to plant our garden! Just the right age book for my friend’s son. It is books like these that make reading fun! I hope you have a really nice Thursday! Stick cat book looks fun for the kids. 5 18 comment – I wanna start working in the garden! The Olga book looks fun for the kids. 5 19 comment – enjoy your weekend! I hope you are having a really nice Saturday! daily comment 5/20 Thanks for the chance to win, my daughter would love this prize pack. A lot of kids would enjoy reading this book! Live in MN – raining way too much! Thanks for the chance to win! My daughter would love to read these! My daughter would love these books. Happy Sunday – take the day off. 5/21 have a blessed sunday. I hope you have a peaceful Sunday. 5 21 comment – hope you are enjoying your Sunday. I cannot wait for summer! 5/21 Thanks for the chance! These look so great! I think my Granddaughter would love them. My Grands will like these books! 5 22 comment – Visa gift card would be fun to shop with! 5/22 entry Thanks for the chance! Already 5/23 in your blog. I hope you are Having a really nice Tuesday! I could really use this gift card! I would be happy to win! My daughter would enjoy these books. this looks really cute. thanks for the chance to win. I know my granddaughter would love these! These books would be perfect for gift giving. I sure would love to win this one for the kids for the summer thanks for the chance. Rain today but I hope it stops by the afternoon. Have a wonderful Thursday. Thanks again! 5/25 Thanks for the great giveaway! my comment did not post today so I am trying it again – I would so love to win this one for the kids. Have a nice day. I really am hoping to win! Yeah for Memorial Day weekend! My granddaughter would love these!! my comment is not posting so I am going to try it again today – We would love to win this one hope you have a nice holiday weekend thank you. 5 26 comment – have a great weekend! We love to read and these look fun. My niece would be thrilled to read this! 5 28 comment – We hope to go to the lake tomorrow if the weather is good. Looks like a fun time for my granddaughter. I would love to share these books with my kids. Hooray for 3 day weekends, nice weather, BBQs & good friends. 5 29 hope you’re doing something fun today! My nephew loves cats and would probably enjoy the book. This is a wonderful giveaway. Have a wonderful week. I would love to win this to share with my students! Another fun summer read! Hope we can win! I know a lot of kids that would love to read this book. These books sound awesome! Great for summer reading! My daughter is a big fan of Stick Cat! my daughter would really like this book. thanks for the chance. These sound fun to read. My nephew would love these books! Especially Olga and The Smelly Thing From Nowhere!! Too cute!! Following Classy Mommy on Facebook as Sharon Braswell. My littles would love these! 5/30 thanks for the contest. This looks great. I’m sure my grandson would love to read them. Look like such fun books! These books remind me of Phoebe’s smelly cat from friends.